male pattern boldness: Brick-and-Mortar Shopping -- YEA or NAY? For me, it's been more than a decade, though I walked through Macy's Herald Square store with Michael last Sunday just to see the annual flower show. It was not quite as exciting as I'd remembered it, though certainly jam-packed with tourists. But it isn't only department stores I avoid, it's almost any store other than fabric and notions stores, which I visit often. I like to be able to see (and touch) fabric in person, as colors, textures, and scale-of-design can be hard to communicate accurately over the internet. I'm fortunate to live in a place with a substantial (if shrinking) garment district; most sewers no longer have access to that, I know. Mostly, though, I find shopping online incredibly convenient -- fun even. I can hunt for exactly what I like and find it in stock. I don't have to leave my house or get on the subway. There's no waiting for a sales person to ring me up. Plus you get a package delivered to your door -- presents! I used to love shopping in stores, especially growing up. 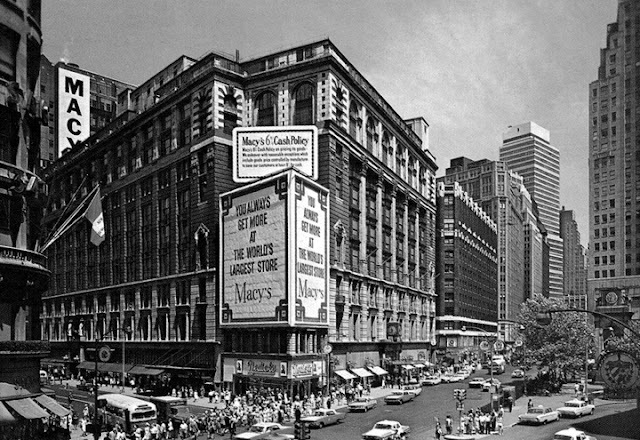 An outing to a big-city department store -- and I'm not talking about luxury stores like Saks Fifth Avenue but middle class stores like Macy's, Gimbels, and Korvettes -- was something special. The selection was vast and the atmosphere was bustling. Maybe it's because I'm older or the stores have less individual personalities (since many are owned by the same corporations), but store shopping holds no interest for me. I'd much rather go to the Salvation Army or my local flea market, where I can be sure to find something truly one-of-a-kind and much cheaper (if not returnable). The few times I've been clothes shopping in the last decade or so, the merchandise seemed remarkably low quality for the price, and the endless discounts offered (I'm looking at you, GAP), only made it seem cheaper. (If you can't move your inventory for less than 60% off, maybe you need to rethink your strategy.) There's so much sameness and so little energy, unless you're shopping in true luxury stores (and paying for the privilege). I know there are many reasons to be critical of Amazon, but they do have a pretty seamless system in place from the customer's point of view. And it's great to know that, almost without exception, you can return an item easily if it doesn't fit or meet your expectations, no questions asked. Then there's eBay, where you can find just about anything, new or second-hand and, if second-hand, usually much, much cheaper than a brick-or-mortar store would sell it for. I've found most of my vintage sewing machines on eBay, not to mention everything from vintage Jockey undershirts to my favorite cologne (Cacharel L'homme). 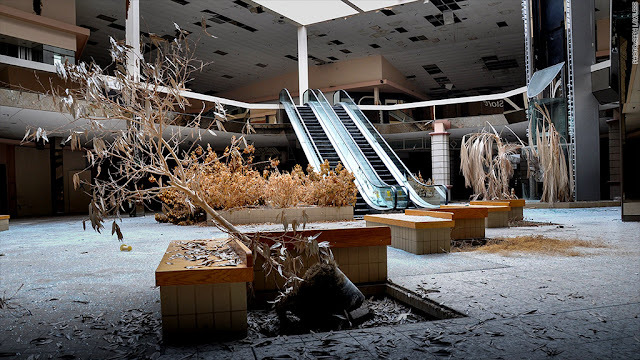 I've been reading a lot of articles lately about major department store chains closing stores, about dying malls, and major shifts in the way people shop. It seems like things are going to be very different in the future -- or not, who knows? 1) Do you still find shopping in a store a fun -- or even practical -- experience? 2) Are there items, other than food, that you can't or won't purchase online but must go to a brick-and-mortar store for? 3) Do you ever feel nostalgic for shopping the way it used to be? I do find in-store shopping fun - but I mainly go to the high-end stores (so I don't do it often given the price and given that I need very little). I can't think of anything I wouldn't buy online, if I could find it and the shipping weren't prohibitive (which is often the case). For some reason, I'm very irritated to pay for shipping, but not the exorbitant mark-up at a B&M store. I do feel nostalgic for old-style shopping. It was SO exciting. But shopping now is much more convenient and efficient. So it's a decent trade-off IMO. I like going to shops, but I generally don't buy anything. I guess I just enjoy looking at stuff. Peter - I read this shaking my head yes! And I buy groceries online...my local supermarket lets you order online and they deliver from 7am to 10pm 7 days a week! I HATE the mall where they are still visited by quite a few people here in the 'burbs. And the last department store I was in was Macy's Herald Square and that's because it's near my job. I so agree about shopping online, it's just more convenient. I think my grandchildren will never know what a department store (like the kind we shopped at) is especially since their parents shop at Target, Walmart and Costco. That's a coincidence because I haven't been in a department store for more than a decade either, but I was running early for an appointment last week and decided to walk through Macy's. Quite disappointing really, the choices seemed limited and the prices astronomical. Nothing even inspired an "I can make that" idea. I grew up in the 60s, and the only thing I feel nostalgic about (shopping-wise) is the variety we used to have when most stores were individually owned and each one had a different selection. For that reason I still enjoy used bookstores and local artisan shops, but otherwise I default to Amazon. I used to enjoy shopping in stores, but that was before I had kids--ha! Seriously, though, I share your feeling about them; things feel cheap and the pricing strategy kind of makes me nuts. I don't like going into stores that are overstuffed--it makes me think about how much of it is ultimately going to end up in the bin. Maybe it is my legacy of living in Russia, but I find most stores overwhelming--there is just too much of everything. Too much stuff, too many choices. I just want a dumb tube of toothpaste--I don't need 25 varieties! Ditto for soap and other things like this. Online shopping removes a lot of that anxiety for me. I also find it to be more economical for our family most of the time. Plus practical: we live in a big urban city not unlike NYC, and having to haul large quantities of things on foot over many city blocks with small children in tow is not.fun.at.all. That said, I do get some things in the big chain drug stores when needed, and I do shop in grocery stores for certain items (we mostly use a grocery delivery service that comes from a chain-store warehouse, but some things have to come from Whole Foods or Trader Joe's). I do enjoy thrift shopping when I can do it, however! Flea markets are always good for a browse, and I love used bookshops if I have the time. I think the character of those places appeals to me. Agree on the huge number of choices. A whole aisle of laundry detergent? Really? I used to buy virtually all of my drugstore items online, but my preferred place, drugstore.com was bought and shut down by a competitor. On principle, I do not shop at the competitor for that reason. So I looked for a replace. I thought I found one, but then it turned out to sell certain merchandise that makes it unacceptable. Then there is the big site which I am avoiding as much as possible for the same reason. So I'm back to the neighborhood drugstore for now. It's better than I remember. Ha. I have almost the same list. Bambergers, Gimbels and Korvettes. (Northern NJ) Malls are ok, but the stores and merchandise seem to be aimed at a younger demographic than me. We do go to the mall with the Apple Store though! The mall near my house is dying, Sears and Macy’s just closed and many of the stores are empty. It will most likely be replaced by one of the trendy new shopping “villages” (for lack of a better word) that are supposed to be homey and walkable. Meh. It’s still basically the same stores but you have to go out in the weather to browse around. Not on a 100F NC summer day thank you! Even worse are the shopping centers where you have to drive from store to store because they never thought you’d like to park your car just once. Quite a hike (and often dangerous) during the holidays when you don’t dare loose your space! So yeah. Often Amazon wins. I buy lots of stuff online (Amazon Prime FTW! ), but I actually prefer shopping in stores. It gives me an excuse to get out, and I'd rather pay a markup as opposed to shipping. I also work in retail part time, and the stores won't stay open if you don't spend your money there! Especially with the smaller businesses, it keeps money in th community. I do miss how shopping used to be. I feel like every store sells mostly the same product. The sameness makes me really sad. Amen to keeping money in the community. I don't buy basic household stuff online, because I want to keep local stores open and sales taxes in our community. Special things I can't find locally I will buy online, new or used. I have many eBay finds that gave me the same treasure-hunting fun as thrift shopping. Most of my clothes and a lot of garments bought for their fabric come from local thrift shops.I also agree with Peter and Lladybird that the distinctions between stores has mostly disappeared, so it's less interesting to shop now. I'm definitely in this camp! If something is available through a locally owned store, I'll go out of my way to shop there: my local food co-op, small fabric stores, jewelry or shoes or books. I also make jewelry and need to see the stones up front. But. I hate malls and avoid them. I am an Amazon Prime user for things difficult to find locally & also mail order fabric, interfacing or notions. As a small business owner, I want to keep the money in my community. But as a consumer, I do appreciate the boxes delivered to my door. As a kid growing up in Michigan I loved going to hudsons! It was a treat because we wore our Sunday best including gloves and a hat! They seemed to have everything and everyone treated us so kindly. Sadly, customer service has died and everyone has the same merchandise. I recently retired and am beginning to make my own clothes. I find such satisfaction from sewing them and mostly from having clothes that actually fit. I'm a bit Amazonian and have never had much luck buying off the rack. I also like having something no one else has! Most of my online shopping is for my grands! Toy stores are a nightmare! Lol! Back in the day it just meant tall girl!! I visit our local thrift shop frequently but I detest department stores. I have favourite grocery and bulk food stores, as well as local small business shops. I shop online when I can't find it locally or for a good price. Fabric and yarn stores are, without question, my favourites! Lol! 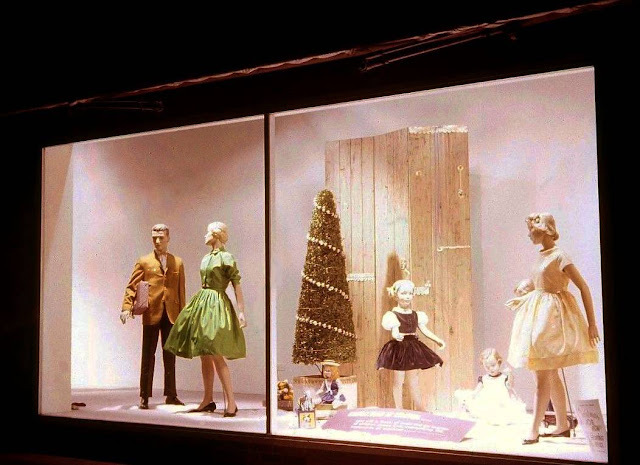 I miss the big exterior store windows that used to change with seasons and sales (the Internet of its time in 70s and 80s) and provide outdoor pedestrians a reason to stop and look at the displays or chat with someone about the windows. I still go into Sears and the Hudson Bay for some clothing items like underwear (never know what country of origin I'll find on my Jockey underwear or tank tops or design changes), socks and the odd top or sleepwear item. I cannot rely on the Internet for shoes unless adequate photos from all angles top and bottom and profile let me determine whether I risk an order for shoes in my size or not. I prefer to try shoes on and I now go to a clearance store of the local specialty shoe store in the bigh city to check for the few pairs in my size (unless something I loved sold out before I came back with money). Bed and bath linens-touch test in person. Reading the country of origin, care instructions and deciding if the colours look anything like the ones shown in promotional flyers or online photos. If the "hand" is not right, the product does not go to the checkout. Recently saw a floral botanical jacquard towel in a Hudson's Bay home flyer-four different solid colours. Thought the dark turquoise could be the one colour to add to home but in-store, the colour was rather too dark to be of use in a small bathroom that relies on pastel tones to make the room airier than it is and add some light to the room. I still love fabric stores for patterns (the joy of flipping through pattern books! ), notions (seeing which ones exist and which ones are no longer carried or stocked) and the outfits staff sew for display areas. Went to a shoe store with my Mom today and there was real customer service. It was such a novelty. i buy everything i can online, but groceries are a brick-and-mortar visit for me (hello, produce). i am with you about buying fabrics, though -- that generally must be in-store, unless it's just something i can't get locally. and thrift stores are something i visit. but a mall? ugh -- you have to drag me there. they are dead, and for a good reason. For starters, I hate shopping. I am more of a "need" buyer. I will go to a brick & mortar for anything requiring fitting (shoes, clothing) or accurate color matching (many fabrics). Also for anything I need or want to use today. I will buy online for anything that may be a specialty item that chain fabric stores don't carry like good quality knits or elastic lace trim. I have often been disappointed by the quality of products purchased on-line as well as exorbitant costs for shipping and/or returns so this increases my reluctance to purchase on-line. And whenever possible, I am going to buy locally to support local businesses. I don't shop at the big department stores mainly because I think the prices are atrocious. I never thought that I would be able to purchase fabric online, but after moving to a fabric wasteland, I am forced to do so. You are so lucky to have so many choices for fabrics. I have Walmart and a quilt shop, sigh! My other shopping is mainly thrift/estate/garage sales where I pick up a lot of fabric and sewing supplies. It works for me and if I never have to go into a department store again, I certainly won't miss it. I'm afflicted with insomnia so at 0330 I'll pick up the iPad and buy stuff, fabric or feathers on eBay or Amazon, all without disturbing the Husband or the cat. Of course, I've completely forgotten about the purchase when the package arrives. But I do enjoy a whirl through Nordstrom now and again. I remember getting all dressed up as a kid to go with Mom downtown at the department store, it was a big deal and an outing. Topped off with a stop at the candy department for a treat. That was before the big fancy mall opened up and ruined everything. 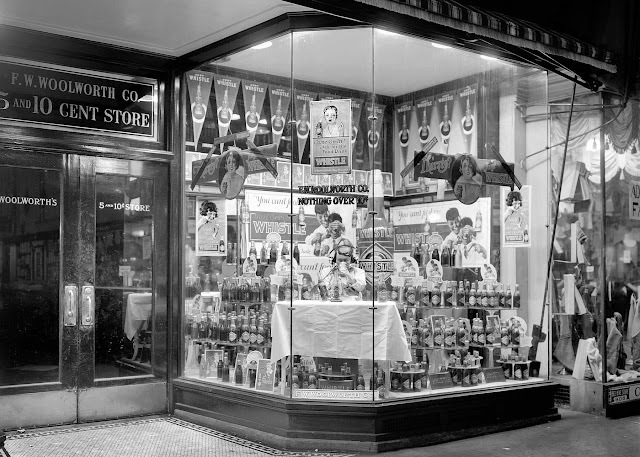 Eaton's, the downtown department store had everything, including a fabric department that rivals today's fabric stores and even offered stools to sit on while you looked through the pattern books. And the fabric--wow, you don't find the amazing quality of fabric they had back-in-the-day at that department store. Last week was the last time I was in a downtown department store, the Hudson Bay, and it was sad. It wasn't the merchandise that caught my eye but how much the store looks like it's being neglected and falling apart. I'm not an online shopper, I like to use my senses when shopping and boy can those shipping cost and exchange rates quickly take the fun out of online shopping. But mind you I can be convinced otherwise if the weather is frightful and the roads are icy. I think I will enjoy shopping but it always turns out to be a miserable experience. I like to support small independent retailers where I can. I buy a lot of presents on etsy for that reason. There is no yarn store near me so that will be online. Interesting Article. I am not that keen on shopping as a hobby or fun pastime. I live in the UK and wish that there were fabric shops locally as like you I would like to see what I buy first, but it is not possible as there is only one shop that sells cheap low quality fabric mainly. I buy my food online as there is a developed supermarket business for that here. I do however do a local food shop at independents weekly,as there is a green grocer and bakery locally. I do feel nostalgic sometimes for the variety of shops there used to be and the fact that there was so many more of them. Most offerings now are chains, all the same and low quality goods. There used to be a huge store selling fabric I miss. Two small independent fabric shops have closed down near me in the last 6 months. with the rise in online and the high business rates for bricks and mortar shops, it is almost impossible to trade now unless you are a chain. The only things that seem to open now are food outlets and coffee shops. It is a a bit sad. I took my comment out because suddenly I realize what a crank I am today. Not good. An interesting and diverse set of comments. You are good people. Excuse me, I have to chase some children off my lawn. Haha!!! I Love this comment! I work in a shop (sports store) and know the customer base in our store is v strong and they come back as they get good service and knowledge etc. there are a few (isnt there always) that gleefully tell me they can get an item cheaper online (and they dont seem to think I would find this offensive - I generally just shrug and suggest its up to them). As regards my own shopping - I find as I have gotten older its a chore - I will go to the shops to look at trends and sometimes stroll for inspiration but I rarely like the cut (except for cos) and now I just make everything. I will still go to the charity shop as to me that is shopping at its most creative! there will however always be a special place in my heart for shoe shopping.............. and this has to be done in person (like a mindfulness exercise). I did not quit the department stores, they quit me. When there are no better dresses appropriate for a 60 year old woman, when nothing fit, I decided the department store simply did not want my money. I still shop with granddaughters, but even shopping for a young person is a chore. Just last week my older granddaughter and I shopped for shoes and swimsuits. We found the shoes she wanted, but in four different stores we could not get her size. Guess where I made the purchase? Yes, Zappos. We trekked through one large "shopping destination" and one dying mall in another town and found one acceptable swimsuit. Lands End got my money for the second swimsuit. Customer service has been scripted out of any store I can afford to shop in. Evidently local retail bricks and morter establishments really don't want my money. That is fine. I spent it elsewhere. 1) I love Amazon and online shopping, but I prefer to go to a brick and mortar store when I buy clothing. Mainly because sizing is so consistent and I am tired of ordering a dress online and having to ship it back because it doesn't fit. At a b&m store, I just hang it back on the rack if it doesn't fit. Also, at a b&m store, I will try on clothing on a whim and sometimes I find some winners that I would never had ordered online. 2) Clothing and food are just about the only things I avoid buying online. 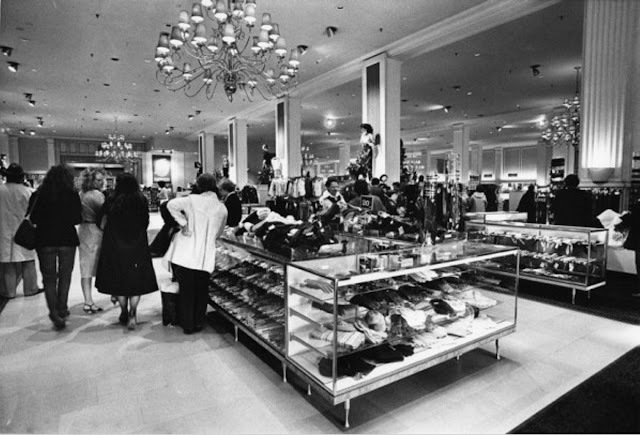 3) And I do miss old school shopping, especially going to the big department stores during the holidays. I started buying groceries online almost by accident. I find I now buy nearly all my non-perishables online, mostly from Walmart.com but sometimes others as well. I find the prices half to two thirds that of my local supermarkets (I live midtown Manhattan) with a much wider selection. It's convenient, and the stuff arrives in 2-3 days. Fabrics I've had mixed luck with online. Candidly, the local Garment Industry fabric stores are much the same price as online, if you compare quality against quality, though Michael's Fabrics Baltimore often has stunning cotton shirting on sale at $7.50. Yet, even Brooks Bros shirts are better priced online than walking over to the Mad Ave store. Books I buy online, period. Home Depot I walk to a store. I almost never buy online from UK stores because of the horrendous shipping charges. (I'd like to get some Harris or Donegal Tweeds but won't pay $35/yard shipping.) Hair cuts and brewed coffee I still buy local. The world changes. It is of some note eighty years ago one could get one's horses shod two blocks from where I now live. I live in a rural county, where I have to drive at least an hour to go to a conventional department store (Macy's)or fabric store (sob). Basically, I do bricks and mortar grocery shopping, and much of the rest online or in our very limited thrift stores. But it saves me a lot of money and time! When I lived in a large metropolitan area, I used to love browsing through Nordstroms, the Bon Marche, and Frederick and Nelsons. It was a completely different experience than it is now. You must be from the PNW. I fondly remember my parents taking us three children to Frederick & Nelson in downtown Seattle every Christmas to see Santa, have our pictures taken, have dinner downtown, buy presents for each other ("Don't look in that bag!") and being awestruck by the beautiful decorations, the specialty holiday foods and clothing, and the genuine good cheer and great service. It was a magical time and experience and I'm grateful to have lived it. What I miss most isn't so much the merchandise as the sense of community. I miss shopping around other people, seeing smiling faces, and other shoppers dressed up a bit. There was a sense that when you went out in public, you aspired to be a little better than at home, a little more polite and gracious. Modern life offers many advantages but I think we've lost some of what makes us human. I found I shop less in stores, but then since I am retired my clothing needs are vastly reduced as are most needs. I have too much stuff already. I do go shoe shopping in stores, often Macy's, but once I find a brand that fits well I will order the next ones online. Fabric.com is good if you know the manufacturers quality which is easy with the quilting cottons and upholstery weights that I buy for the items I sell on Etsy. I have also found some food items that were discontinued in my local stores that I can get online. I do shop online, more than I like to admit, but mostly for things that I can't find locally. My preference is brick and mortar locally owned stores rather than the big box stores. Having been in retail myself, I know how hard it is to compete when products are sold online for less than your wholesale cost. Local businesses keep the money local, support local charities, and offer expertise that may not be available online. For most clothing I have to shop in a store where I can try things on, because I am hard to fit and don't like the hassle of returns. Thrift stores are also a favorite. The level of attention toward display, signage, store fragrance (they all had their own scent - recall how you knew a store by it's smell), and now it's just homogenized hoo-ha. Stores used to differentiate themselves at every turn, now it's done mostly through touting in-house brands (in-house brands were the least they could do, now it's all they can do, along with a few pieces of crappy "on sale" signage). Stores that look neglected are, in fact, entering the death-agony phase of operation. The reason: we are all poorer (even if you have seen a shift upward in your wealth, pay has not kept pace with inflation or productivity). There is an open acceptance of thrift stores and flea markets as an option in these comments, that may not have been as viable an option by the same commentators so many years ago. The post-WW2 era has ended for most, and living minimally is fast becoming the necessity. Delivered-to-your-door is the new hoo-ha; the hidden value we now crave. Shopping in-person is now longer a pleasant recreation. Today's hidden pursueder is the speed of delivery; instant gratification on your doorstep, and people are discussing how quickly they receive things ordered on-line ("20 minutes!"). The lost retail jobs in my area are now morphing into warehouse and delivery jobs. Warehouses that are increasing robots among their work forces. Very few middle-people will be involved in retail once drones and automation dominate. The splash of a webpage is hardly a substitute for the retail experience of old - we are entering yet another version of a world without charm. No argument here. Well said! I still love brick-and-mortar clothes shopping for the same reason I love brick-and-mortar book and music shopping: I love discovering new things, and it's a lot harder to do online. Also want to support our local stores (they keep closing! it's really sad). We have one independent bookstore left in town and I'm hoping it can stay open. I never liked to shop, for anything, until -- with the Great Recession of 2007 -- my husband and I "discovered" thrift shopping. Now we make it a regular part of our weekly routine, as much to visit with our favorite clerks as for the thrill of the hunt. It's like visiting a weird little museum, in which one is encouraged to touch the exhibits. I also despise shopping on-line, especially for fabric. I much prefer to see, touch, and smell fabrics that I consider purchasing. A tiny sample from an on-line retailer does not give me good information about drape, or how the finish used on the fabric might stink. I have routinely shopped online since about 1997. I can never find my size, tall women's, in a store so I have been forced to shop for clothing online. I never find knowledgeable salespeople so my go-to is online research. My first stop when seeking products is to research online and then find what bargains I can and they are usually online. I also don't appreciate dealing with salespeople 'attitudes'. Why shop anywhere else? I make most of my clothes but do enjoy shopping if I want to buy. I'm hard to fit and enjoy the trancelike state shopping can induce but what a time waster it is! But still, I need to try things on and find boxing things up and sending them back a hassle. I still like going to the mall. I like seeing things that I might want to buy up close and personal. And I like being around people, so I enjoy going into brick and mortars. The only reason I used to drive to the Mall was the fact my dentist had his office there...then he died and I don't have to go there anymore. I like feeling towels and bedding at Penney's but they are dying. Sears is closing so we will be left with Target and Kohl's, fine for kid's and teens but not for a mature woman. Nordstrom is a 5 hour's drive away. I remember dressing up as a child to go shopping in downtown LA in the 50's. Buffums, Bullocks, Broadway, Magnin...you might even see a movie star back then. I go to "real stores" to buy groceries, pet food, and linens. I also go to and enjoy real hardware stores and thrift shops. I used to love fabric stores but our only quality option is now super far away, and thus not worth it. Everything else is on line......easier, cheaper and much less annoying. I do a lot of my shopping in brick-and-mortar stores. It helps me control my spending (I live in a city and don't have a car, I can only buy as much as I'm willing to carry home!) and I do my best to support smaller local businesses this way as well. I know I'm old fashioned, as a younger person, to shop this way, but it makes me feel more connected to the people around me as well. And the joy of getting to touch the things you choose before putting money out there for them is a wonder to me, I hate returning things. I live in a very poor state (NM) with a service/consumer economy, so I try to shop brick-and-mortar as much as possible. Revenue drives workers' schedules. I mostly shop online for fabric. My first job was at a locally-owned department store established by a woman started by selling dress samples from NYC on her porch in Buffalo. That store is gone, along with four others like it. It's a huge loss, on so many levels. It has been over 20 years since I went to a mall. I became sensitive to perfumes and scents. I spent years shopping from catalogs. Since 2008, I have sewn all my clothes and bought my underwear either from catalogs or grocery stores. Now I buy a lot of stuff online because there are somethings that stores will not sell. I have to go to Amazon to buy the flavor of Jello I want, and the birthday cake mix for our daughter's birthday. Other things I want but are never carried in stores. We have plenty of stores but actually fewer items that they carry. They have to have plenty of Liquors on the shelves but Jello etc is not there. Frontier Coop and other online sites have been a life saver. I only buy online. Occasionally I will shop at stores for nostalgia reasons. Mostly buy online because there is far more variety and options. I shop food at the store. I buy specialty items and out-of-print books online, but I shop in stores for everything else. I'm fortunate to live where we have a number of excellent independent fabric stores because I can't imagine buying fabric without touching and seeing it in person first. Our local mall is dying which makes me sad. I don't want to rely on the internet for basics. Pre-internet, I always loved catalog shopping so internet shopping seems like an updated catalog to me. Some people feel guilty about buying online instead of "local." I don't. Many of the online shops I have bought things from are in fact small businesses in the USA and have both a brick and mortar and online presence. In some cases I am buying online from a local store to skip traffic and parking hassles. Is the person buying from this type of shop in person more moral than I am when I buy from the same shop online? I have had GREAT customer service from some online shops that took the time to answer questions and check stock for lot numbers. I have had terrible service from in person shops (yes even small family owned businesses) where the sales person acted like they were doing me a favor by taking my money. The brick and mortar shops I still frequent are mostly specialty shops- a French soap/perfume shop, a tea shop, a spice shop, a sports shop, the fabric shop, the Chinese grocery- and usually very pleasant to browse in on a rainy day because I find items I didn't know existed and therefore could not have googled for. I remember shopping as a hassle for me but delightful for my mother, who liked lunch in the department store restaurants. Now I am mature, and have retired; the restaurants are gone, and most of the stores too. I shop online and also in the local stores we have, but there aren't many of them. Some of the malls do wonderful decorating and offer a kind of window shopping entertainment. But the chain clothes and shoes seldom fit me, so it's a rare outing to go to a mall. I grew up in The Netherlands in the fifties and we had a big department store (it closed two years ago). I remember my mum taking one of us 7 children in turn for an outing to the store, as a treat. They had an elevator that had glass sides and a uniformed man to operate it, and one of those air-hose systems that shot a tube with your money to a central checkout and sent the change back. All very exciting! When an escalator was installed, we had to go up and down countless times, of course. The day always ended in the tearoom with a special treat. Good memories! I like shopping in real shops, my favourite shops are large hardware stores. Fabric shops are my least favourite shops, I get overwhelmed by the choices and all the prints. I do shop online occasionally but tend to spend money on items I don't need and wouldn't have bought had I been in a proper shop. I dunno. Brick and mortar only works for some things. 34th Street is a whole different animal, since they count on tourist traffic to move so many things AT ANY PRICE you're willing to pay. Hard to say. I don't really shop in department stores, except for the things I know exactly where to buy... I'm particularly brand loyal and specific, so... I dunno. Department stores are great for research on so many things... who knows what the future holds? For me it depends on the country. Department store shopping in Japan is dreamy - and apart from the department stores they have amazing retailers like Tokyu Hands, (gigantic) MUJI stores, Seibu Loft and... and... and... Department stores, and many stores, here in Australia are significantly less exciting. I remember shopping at the fancy department stores in downtown Chicago as a kid, and it was a great experience. You could get things there that you couldn't get in my borderline rural area. There were beautiful displays; I remember a whole floor of flowers. And the Christmas windows, of course, were wonderful. Things are different nowadays. The malls offer a bland, homogenized experience. The same stuff is available everywhere across America, and is also available online, so why should I not try it on in the comfort of my own home, rather than schlepping around the mall? I remember going to dept stores many years ago and enjoying the experience. Today, however, I avoid going to dept. stores and malls. Like other posters have said, malls and big chain stores now offer all the same merchandise and there is just so much of it. It just doesn't appeal to me. The only stores I enjoy going to are fabric and notions stores. I agree with you totally Peter! Many years ago I used to love going to the department stores and looking at all of the beautiful clothes! It was definitely a pleasant experience! Unfortunately, I locational he end up in a department store only because of my hubby! However, even that is starting to dwindle because I am starting to make his shirts and T-shirts too! He wears a lot of jeans and we can purchase those online too. So hopefully my trips to the department store will come to a halt altogether! It's so sad too because that again means loss of jobs! However, in addition to most of what's been mentioned above, my experience on occasion has not been a pleasant one because of the crowds in the stores and the understaffed, overworked not be as courteous and/or friendly as they normally would have been in the past! Great post Peter and my Amazon account is booming right now! ... I just noticed the typo above, I meant " occasionally", not "locational he"! LOL! I tend to avoid department stores in favor of boutiques. I like a particular women's clothing boutique, my husband favors a privately owned men's store in the small town where my folks live. It's small, we park on the street out front, someone is happy to help us, the place is neat and clean and pleasant. Once or twice a year we stock up, like big-kid back-to-school. It is still the same SmartWool socks, blazers, jeans, and Pendleton wool shirts/sweaters, coats, but we're supporting a local family and a local business. I hate malls and big box stores. You park 100 miles away, walk all over, they don'thave my size, and it's cheap crap. There is so much garbage that people don't need and are enticed to buy. This mindset of redoing the living room (or whatever) every few years to be 'on trend' is wasteful. It's like the mall is the pre-dump. I used to like going shopping when we travelled, but it gets harder and harder to find anything interesting or unique. It's all the same stuff whether here or 2000 miles from here. Same brands, same mass market lowest common denominator appeal, nothing interesting. I can buy boring online. I hardly ever go to brick and mortar stores of any kind anymore. My husband does most of our grocery shopping. I do go to the local quilt shop for fun, to shop, and for classes, because we need to support our local 'hobby' shops or they will close. Online shopping for almost everything is just so easy and fun. You can zero in on what you need without too much distraction. What is frustrating about shopping in stores is that every store apparently decided to start carrying everything. When Home Depot is selling dog food and bottled water it just gets to be too much. I have not bought anything in my Maryland department stores in just about the same time as you mentioned. But I love my at least six yearly visits to Fabric Mart in PA;-) I did go visit Dillards and Nordstrom and Saks when we in Florida this season just to do some snoop shopping...which feels much like ordering online from say, DSW, but returning items in person to the brick and mortar store. Amazon has made shopping so easy and I am expecting seven, yes, seven pairs of shoes to arrive from Zappos this week. Their "free" returns mean that I hope to find the one and maybe two pairs that I want for an upcoming trip and get to send back the rest. Free shipping, free returns. I'd like to buy something like that locally but I'd have to spend hours going to several places to get the variety of brands and then hope they have my size in stock. I'll be traveling this year and I'd like to bring home something local but it's so sad to find the same boring, homogenous brands glaring at me in other countries. Wednesday at Macy's. Bought mascara at the Lancome counter and perused the women's clothing racks, but did not buy any clothing.